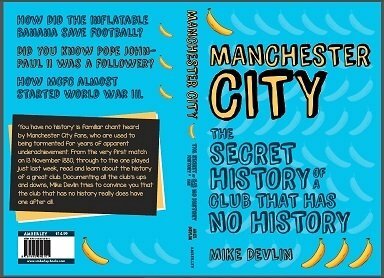 COMPETITION HAS ENDED: ‘Manchester City: The Secret History of a Club That Has No History’ Book! Shoot! are giving you the chance to win a copy of ‘Manchester City: The Secret History of a Club That Has No History’. ‘You have no history’ is a familiar chant heard by Manchester City fans, who are used to being tormented for years of apparent underachievement. From the very first match on 13 November 1880, through to the present day and beyond, read and learn about the history of a great club. Documenting all the club’s ups and downs, Mike Devlin tries to convince you that the club that has no history really does have one after all. So, ahead of Manchester City’s visit to rock-bottom Sunderland in the Premier League on Sunday, where Pep Guardiola’s men are looking for their fourth successive league win, Shoot! are giving away one copy of this amazing book to one lucky fan. To enter our free competition to win a copy of ‘Manchester City: The Secret History of a Club That Has No History’, enter via our widget below. Good luck!